A 29-year-old female presented to the outpatient clinic for evaluation because of a recent onset of chest pain with exertion. A physical examination was unremarkable. A resting electrocardiogram showed normal sinus rhythm with no abnormalities. An exercise 99mTc-Sestamibi single photon emission computed tomography (SPECT) scan was performed. 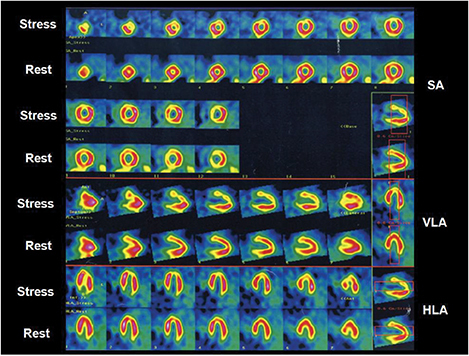 A treadmill test showed non-specific ST segment changes during exercise in V2-V5 leads and myocardial perfusion demonstrated mild ischemia in the mid-anterior and apical walls (Figure 1). In light of these results, the patient underwent computed tomographic angiography (CTA) for further evaluation. Not surprisingly, the patient’s coronary calcium score was 0. 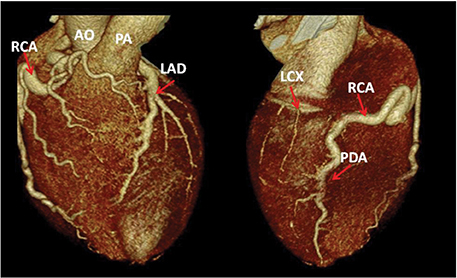 The CTA revealed that the left coronary artery (LCA) arose from the postero-lateral aspect of the main pulmonary artery (PA) (a diagnostic hallmark), just beyond the pulmonary valve (Figures 2 and 3). The right coronary artery (RCA) was dominant and markedly dilated and tortuous. Abundant interarterial collateral vessels between the RCA and the LCA could be appreciated (Figure 2). There was no significant obstructive coronary artery disease. 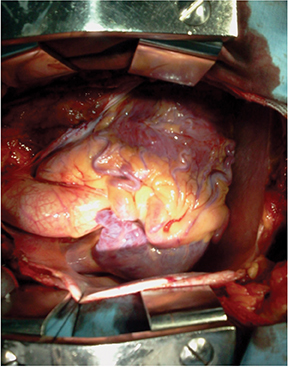 The left ventricle (LV) was mildly increased in size with preserved ejection fraction (Figure 4). Mild mitral regurgitation was also present. 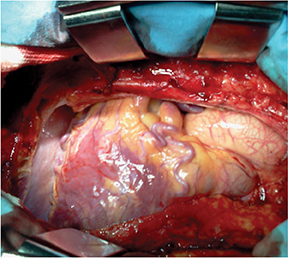 The patient was referred for surgical repair (Figure 5), with successful placement of a bypass graft (left internal mammary artery) combined with ligation of the anomalous LCA. Coronary artery anomalies are found in <1% of the general population1 and can range from a benign incidental finding to the cause of sudden cardiac death (SCD). Anomalous origin of the left coronary artery from the pulmonary artery (ALCAPA) syndrome or Bland-White-Garland syndrome, first described in 1933,2 constitutes a rare congenital condition that affects 1 of 300.000 births.3 ALCAPA syndrome can be classified into adult and infant types, depending on the tendency to develop collaterals between the RCA and the LCA, respectively. Most children with ALCAPA die within the first year of life. Rarely, ALCAPA syndrome manifests in adults with symptoms of heart failure, mitral valve insufficiency, angina and/or myocardial ischemia due to the “coronary steal” phenomenon. Fatal complications include myocardial infarction and SCD secondary to ischemic ventricular arrhythmias. We describe an adult type of ALCAPA syndrome. Traditionally, invasive angiography has been used to diagnose coronary anomalies. 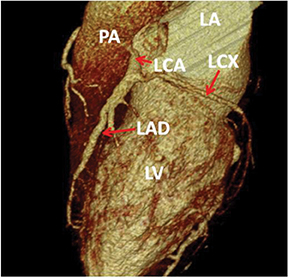 Owing to substantial advances in cardiovascular imaging over the last 2 decades, CTA has now emerged as the standard of reference for identifying and characterizing coronary artery anomalies non-invasively. CTA features comprise excellent spatial and temporal resolution, 3-dimensional depiction, and a large field of view that provides reference landmarks for precise anatomical assessment of coronary anomalies. CTA is also valuable to assess for possible postoperative complications. Rigatelli G, Docali G, Rossi P, Bandello A, Rigatelli G. Validation of a clinical-significance-based classification of coronary artery anomalies. Angiology. 2005;56:25–34. 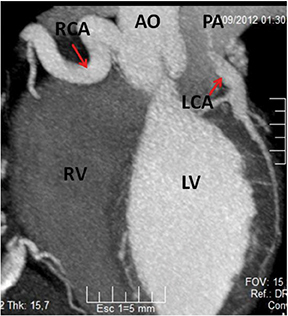 Bland EF, White PD, Garland J. Congenital anomalies of the coronary arteries: Report of an unusual case associated with cardiac hypertrophy. American Heart Journal. 1933;8:787–801. Dodge-Khatami A, Mavroudis C, Backer CL. 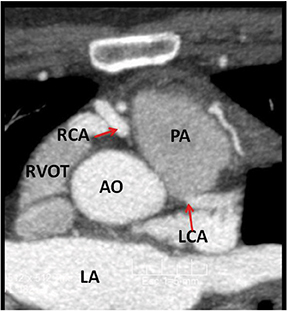 Anomalous origin of the left coronary artery from the pulmonary artery: Collective review of surgical therapy. Ann Thorac Surg. 2002;74:946–955. Radiological Case—Bland-White-Garland syndrome: Value of computed tomographic angiography. Appl Radiol. Prepared by Dr. Ziadi and Dr. Villavicencio while at Diagnóstico Médico Oroño, Non-Invasive Cardiovascular Imaging Department; and Dr. Diodato, Dr. Ameriso while at the Cardiovascular Institute of Rosario, Cardiovascular Surgery Department, Rosario, Santa Fe, Argentina.